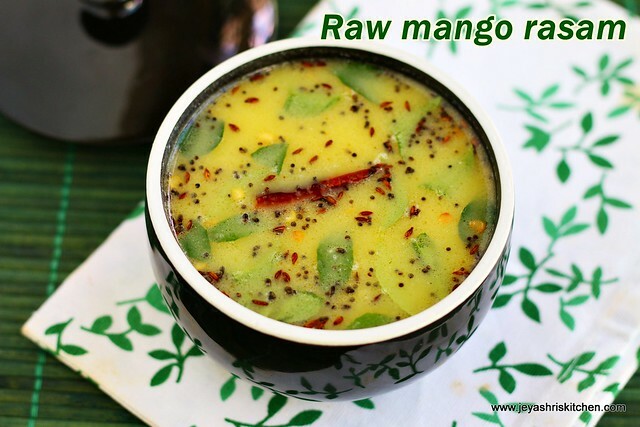 Mavinakai saaru | Raw mango rasam is a simple and easy no cook rasam. I learnt this recipe from my friend who taught me the recipe of veg saagu, basically a Kannadiga dish. 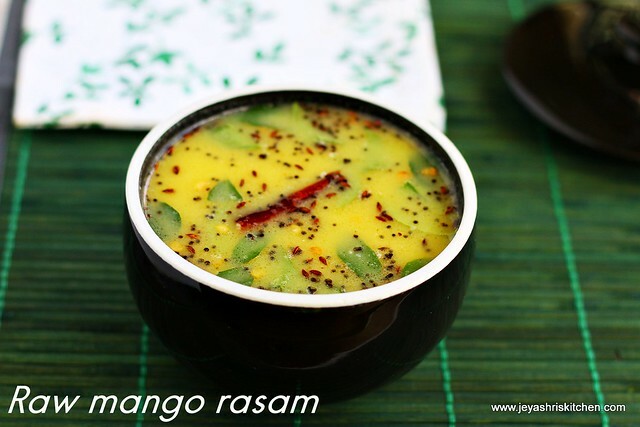 This mango rasam is very easy to make and doesn't involve any cooking process. I tried this today for lunch and it was a super hit. Suresh came home for lunch , enjoyed the rasam very much. I had the rasam with rice and also had as a soup too. I can this is a perfect bachelor recipe too. Thank you so much Meera for this raw mango rasam recipe. Peel the skin of the mangoes and cut them into big chunks. Grind the mango, green chili, salt and coconut into a fine paste. Add little water if needed. I forgot to add coconut, so added 3 tsp of coconut milk in the last. Strain the mixture using 2 cups of water. In a small pan heat coconut oil and add mustard seeds,urad dal,jeera, asafoetida and the mor milagai or red chili. Once the mustard splutters and the dal turns golden brown add this to the mango water. Since i didn't add coconut, i added 3 tsp of coconut milk to the rasam and mixed it well. Serve this rasam with hot plain rice and any curry of your choice. The rasam will be in room temperature only. So serve it with hot rice. If you do not have added coconut while grinding, add coconut milk in the last. Mor milagai can be replaced with red chilies.